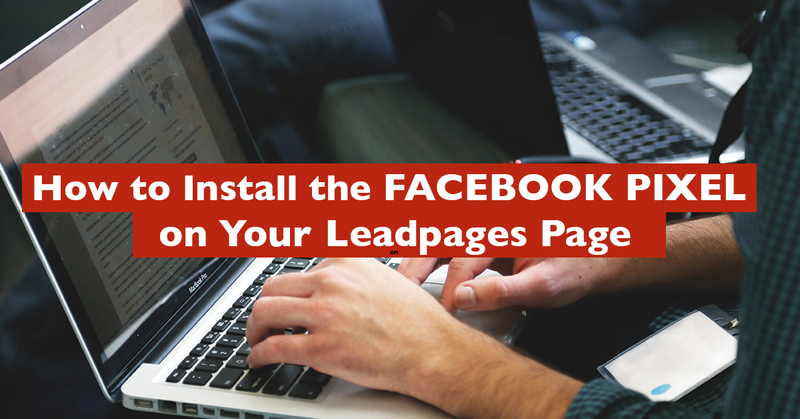 You’re ready to get started with Facebook ads – awesome. You know you can get your work in front of a specific audience, clue them into your offerings, grow your list, and even make sales. What you can’t do is understand which ads worked best if you didn’t have the Facebook Pixel in place from the get-go! Track any conversions that come in as a result of your ads. First you need to define what the “conversions” in your business are. Most online entrepreneurs consider any kind of transaction a conversion. In other words, when someone buys something from you, they convert from a prospect to a customer or client. When I subscribe to your newsletter. When I see a product I like on your ecommerce store and add it to my cart. When I sign up for your free or reduced-price trial membership. When I click from your blog posts over to the sales page of your product or service. With Facebook ads, it’s REALLY easy to see not only which ads/audiences are getting you the most conversions, but how much each you’re paying for each one. So it’s time to install this pixel and then set up conversion tracking! Click on the little menu icon at the top left of your screen, and then scroll over All Tools. You’ll see a bigger menu pop out to the right. 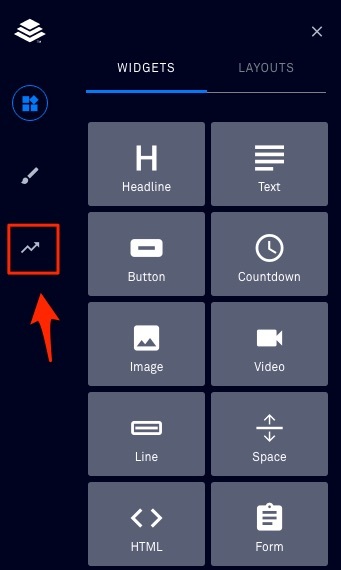 Click on Pixels under Assets. Click on the green button that says Create a Pixel. Give it a name like “[Your Company Name] Facebook Pixel.” Then click the Create Pixel button. NOTE: if you don’t see the green Create a Pixel button, it means you’ve already created your Facebook Pixel. But to be certain you’ve installed it in the correct place, click on the button that says Actions and then on View Pixel code. Continue to follow the rest of these directions. You’ll see a box with several lines of code in it; go ahead and copy/paste the code into a doc on your computer so you can access it later. Now you need to place it in the backend of each of your Leadpages pages. Click for instructions on how to install the Facebook Pixel on WordPress sites or here to place it on Squarespace sites. Important: you HAVE TO add this code to all of your Leadpages pages, even if you use the WordPress plugin. Unfortunately the pixel doesn’t transfer from the backend of your site to “external” pages like Leadpages, Click Funnels, or any other page creators. Sorry! 2. 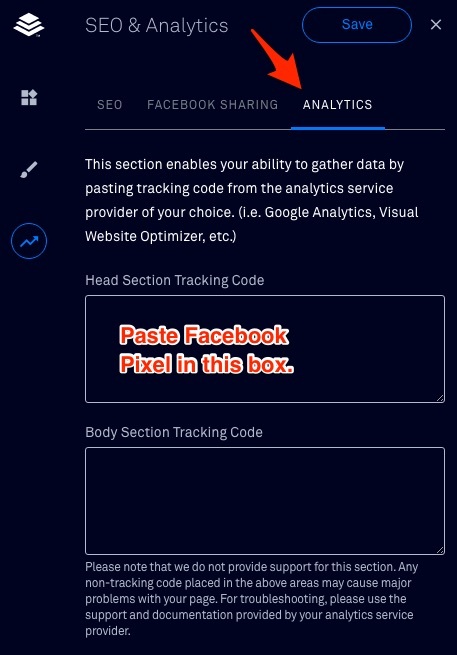 Click on Analytics and the paste the Facebook Pixel code in the box that says Head Section Tracking Code. 3. Repeat on every other Leadpages page that’s currently live. And that’s it! You do NOT need to install any event codes, unless you have hundreds of products for sale on your site. 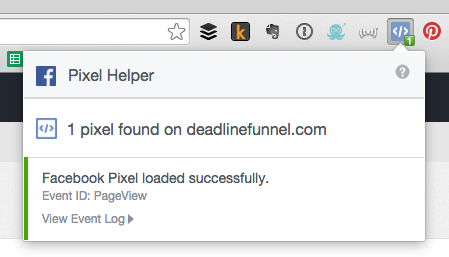 To test that you installed the pixel correctly, install the Chrome Pixel Helper extension (it’s free!) and then visit your site. Now that you’ve installed the pixel, you can get real data about whether people are taking actions as a result of your Facebook ads. The new way (as of late 2015) is with custom conversions. 1. Go back to the Ads Manager and click on the menu at the top left. Hover over All Tools and then select Custom Conversions. 2. Click on the blue Create Custom Conversion button. 3. Insert the url of the page on your site that “marks the conversion.” Usually that means a “thank you” page that people see after signing up for your free content or buying your product. Then click Next. Skip the conversion value (unless you’re tracking purchases, in which case you should put the price of your product). 5. Click the Create button, and relax because you are DONE! You don’t have to install any other pieces of code; the Facebook Pixel covers everything. 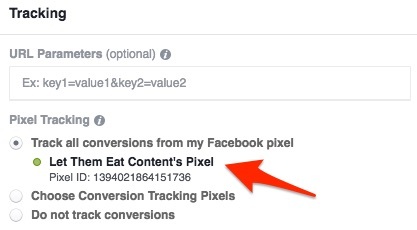 This is one thing I love about the new way to track conversions for your Facebook ads: it’s automatic! You don’t need to “connect” them like you did in the past. You don’t even need to worry about that, though. It’s the default when creating your ads, regardless of the type of ad. Create your Facebook Pixel in the Ads Manager one time only. Install it on every Leadpage you’ve ever created. Create custom conversions whenever you have a new thing that people can sign up for (like a cheatsheet, webinar, interest list, etc.) or product. 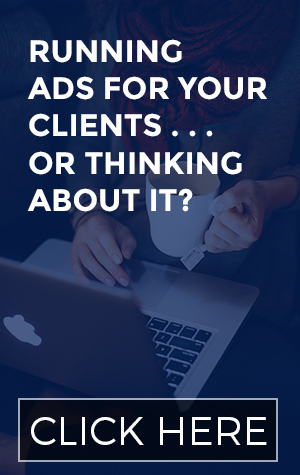 Note: you do NOT need to do any of the following, but if you’re reeeeeeally into tracking stuff or you’re serving a client who likes lots of information about their campaigns, read on! You can also create custom conversions for some more nuanced actions people take while visiting your website. One example is visiting an important page, like a sales page for your product or service. If you have an ecommerce store, another good conversion is adding a product to their cart. 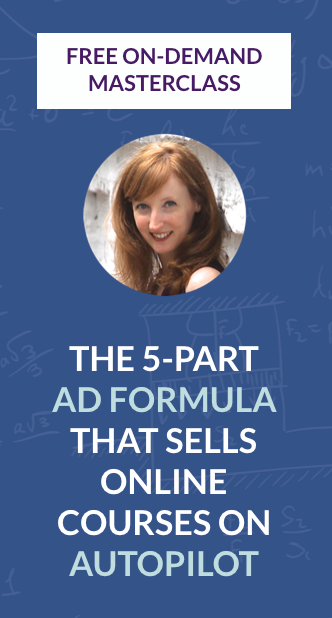 How many people ended up buying your product as a result of your Facebook ads. Adding more custom conversions allows you to see the different steps of your funnel, and to find out how many people are making it from one step to the next. 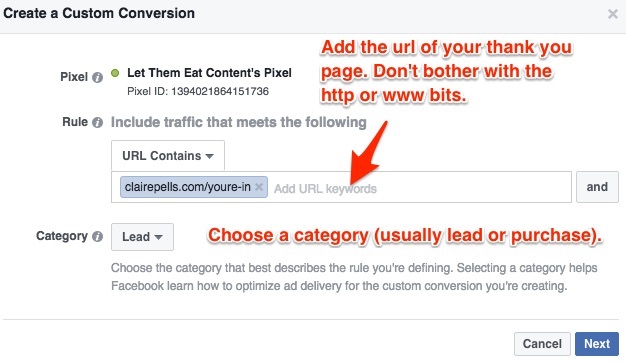 NOTE: remember that Facebook only lets you create 20 custom conversions per account. So once you’ve used up those 20 slots, you’ll have to go back and delete some in order to create more. Does that all make sense? Let me know what your Facebook Pixel or Custom Conversions questions are in the comments below!